Even I’m not old enough to remember the 1938 radio broadcast that took place on yesterday’s date. I am, however, very aware of what it meant. October 30, 1938 was when The War Of The Worlds aired, directed and narrated by Orson Welles. While his aim may have been entertainment, he succeeded in panicking an entire nation, and therein lies the business point. Welles set the story up as a series of news bulletins which interrupted a seemingly normal music program (Ramon Raquello for you detail freaks). Based on a novel by H.G. Wells, the news bulletins told of a war against an alien army – Martians invading the Earth. If you’ve never listened to this masterpiece, you can hear it via this link. Unlike the Tom Cruise movie, this has nothing in the way of visual effects but is far more terrifying. It caused panic all over the country as people fled from their homes. The business point? Almost every business is a content creator these days. While the interwebs may be a cesspool of made-up “facts”, it’s also become a primary source of news and information for a lot of folks. Your business probably isn’t in politics where the standard of truth is just a bit skewed. The self-congratulatory post you add to your blog boasting of your sterling service record might just end up as evidence in a suit brought by someone who was dissatisfied with the reality of your support. Employees might see your website as filled with lies and one of them might decide to be a whistleblower. What they allege might not be true, but it might cost you time and money to prove it. Welles was providing entertainment (although a lot of very upset people didn’t quite see it that way). His Halloween prank would be easy to check out today (although nothing would stop a smart content creator from flooding the web with a bunch of web pages and tweets set to publish just as the prank was being pulled). A certain amount of hyperbole is accepted by consumers; outright lies aren’t. You need to find that line and stay onside. Yes, the screed is a little late today, but I’ve got a note excusing me. It’s signed by Sandy. Once again (by my count, the fifth time since I started this blogging thing) I’m writing at the public library over their wi-fi since a massive storm has knocked out power to Connecticut and most of the surrounding area. I don’t expect it back for a few days (OK, I’m hoping it doesn’t take more than a week) but we’ll try to keep the wit and wisdom coming. Today, I’m going to plagiarise myself and repost the missive I wrote after hurricane Irene hit here a couple of years ago. The point made is still a good one – hopefully you all think so too. More fresh stuff tomorrow. I’m going to pick up some branches in the interim. Substitute Sandy for Irene in what follows and you’re up to date! Like most folks, we had the time in the calm before the storm to take in the patio furniture, buy provisions, and generally batten down. But what should we be doing in the calm after the storm? That’s the business point today as well. Every business endures potentially destructive events like Irene even if they’re not actual hurricanes. The loss of a big account, financial misbehavior by trusted employees – I’m sure you can cite dozens of example, hopefully none from experience. While careful preparation is always the best way to deal with incidents of that sort, I always found it was just as valuable to have a debrief after the storm. In the general sense of relief at the crisis being over, people still have a sharp focus on what tested them the most and how things could have gone better. Sure, you’d rather avoid the events altogether but a clear post-analysis is a critical element in creating the action plan for the next time. And trust me – there always is a next time. We got off relatively lightly – a few branches down and no power for (hopefully) a day or so. We probably should have done a better job of eating stuff in the fridge and freezer the few days leading into the storm since it won’t all fit in the cooler we’ve got filled with ice – that’s the debrief. What are you taking away from the storms that have come your way? We have a running joke here at Rancho Deluxe about the two guys you never ever want to see nearby. You might be thinking they’re the undertaker and the tax collector. Nope. Think for a minute about who are always on the locations of some pending or immediate disaster. Jim Cantore of The Weather Channel and CNN’s Anderson Cooper (but only when he’s wearing a black tee-shirt). Cantore & Cooper – sounds like a law firm but it’s not. It’s far worse than that. In fact, if you ever see either of these two in your neighborhood, get out. If you see them both, prepare for the Apocalypse since the end is near. I thought about that yesterday as the weather-related Mr. C was reporting from Battery Park awaiting the hurricane. Of course, they evacuated the area and I’m not sure if that’s response to anything other than Jim’s presence. But it did get me thinking about a business point. Just as either of these two showing up means trouble in the area, every business has relatively reliable indicators of trouble. They might as easy to find as on a monthly financial statement or as difficult to track as a pattern of employee turnover but they’re there. Every one of us can probably tick off a few that we use to tell us when things might need a little extra attention (or when it’s time to pull the fire alarm). I wonder, however, how many of us formalize that process? Do we compile a list that’s the aggregation of all the factors our best folks identify? Do we regularly pay attention to the data from each of those areas? Or are we more in the business of forecasting by sticking our head out the window to see if it gets wet and proclaim that it’s raining? For our Foodie Friday Fun this week, let’s take just a minute to think about what goes into you receiving a simple plate of food at a restaurant. I’ve been with many folks who order and scarf down their meals without a thought as to the enormous enterprise that went into making that dish happen. I know they thought about if the food was good and if the service was up to their standards. They didn’t really consider, however, all the other elements that go into a great meal. Consider how much work goes into that one plate of food. Someone (the chef) has to plan the menu and order the components. When those ingredients show up at the restaurant, they need to be inventoried and broken down (by prep cooks) into products with which the line cooks can work. Primal cuts are broken down into steaks and chops. Cases of potatoes and bags of carrots are peeled. All this before the real prep work begins. 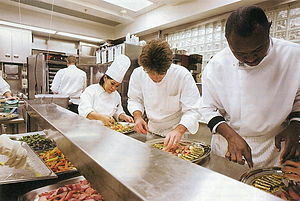 It’s an assembly line of sorts although we don’t think of kitchen work as a manufacturing job. Prep cooks give way to the line cooks who actually fabricate the dish for you. In between are the servers and the rest of the front of house folks. All these people need to be hired, trained, supervised and paid. What’s the business point? The point is that we don’t notice, nor should we. Most of us are in the same boat. When I was teaching I knew that for every hour of classroom time there would be another hour or two of prep that the kids never saw. A simple budget presentation of one slide can involve dozens of people and hundreds of hours of prep yet the only time that anyone asks about the process is when something is out of whack. That’s really the business point. Apple is famous for doing technology that “just works.” Web pages and sites involve thousands of hours of design, coding, and creativity but we tend not to notice that until something broken. We don’t think about how our cars were built and designed until something is wrong. The list goes on and on. Cooking in a professional kitchen involves something unknown to most jobs – the physical reproduction of a product, from 50-60 times a day, presented in a seamless manner. Like the proverbial swimming duck, there’s an awful lot going on under the water. We might just be most successful when no one knows that but us! Maybe It’s Easy Because It’s Not Effective? Facebook has also emerged as a favored digital channel among these smaller businesses, likely due to its low-cost barriers and ease of use. In fact, 52% of SMBs said they used Facebook for advertising or promotional purposes, making it more popular for marketing than newspapers (31%), community sponsorships (27%) and email marketing (25%). It’s the “ease of use” thing that has me worried. Sure, it’s easy as pie to post your latest offer or remind fans that you’re open on Sunday. However, as we’ve discussed repeatedly here on the screed, many of those “fans” aren’t interested in anything other than discounts and really won’t engage. Without an understanding of how Facebook works, Edge Rank, and the social graph, the results from Facebook are going to equal the price of entry: not much. More importantly I’m not sure the amount of daily support required is clear to these folks. I also find it of interest that social media is compared with three other forms of customer engagement (above) that are completely different from one another and which should be used for very different purposes. Email should be a lot higher on SMB’s radar than it appears to be. However, it also requires a lot more support (and can be costlier) than what Facebook appears to be on the surface. Sponsorships are great ways to build your email list (or social followers) but if the emphasis isn’t on using email, the value of the sponsorship – and the mailing list access it should affords – lessens. The study concludes with a note that despite all the attention paid to the “social, local, mobile” (SoLoMo) movement, SMBs are failing to recognize the benefits of linking mobile with local, an especially important element for small businesses. No surprise – that’s a very resource-intensive area to do properly. The key, as always, is to match the business objectives with the tools and the budgets. Just as every business is different, so too are the ways in which those factors – objectives, budgets, and tools – combine. As always, let me know if I can be helpful with that. Who Has A Reputation Worse Than Politicians? You Do! When asked if marketing benefits society, only 13% of consumers agreed. And compared to other professions, the results were grim. Teachers — despite how little they are often compensated — were valued at the top of the list, followed by scientists and engineers. That’s somewhat to be expected. But what was more surprising was that advertising and marketing ranked below nearly every other profession, including bankers (32%), lawyers (34%) and even politicians (18%). Marketing and advertising were tied with the job of an actor or actress in terms of its value. Ouch. Then again, we bring these things on ourselves. Think about what the public experiences with respect to marketing these days. Spam in their in boxes. Data being gathered surreptitiously and used without their knowledge or permission. Those go along with issues that have been there for years – ads that seem (or are) sleazy (way too much fine print to be real), using media as a bullhorn via the “spray and pray” method, and an industry with not enough accountability for results. Fortunately, we have a chance to change this as the nature of marketing itself has changed. While consumers don’t like ads in digital (there’s a lot of evidence on that) they DO welcome the opportunity to engage marketers in conversation via these channels. The study shows that just 2% of respondents believe information about a brand from a company’s social-media site is credible, however, so there is some work that needs to be done there. As we’ve discussed before, there needs to be a paradigm shift on the part of we who communicate with consumers before the consumers will respond with a similar shift. It takes time to build trust. This is not a study that should make anyone engaged in marketing feel good. It should be a wake-up call for transparency and more respectful grown-up dialog with our customers. That’s my take. What’s yours? Digital advertising is yielding the spotlight to digital services. The emerging lesson, concludes the study, is that the Internet is actually not much of an advertising medium after all. That was an “ah-ha!” moment for me. Then again, I can’t remember the last time I clicked on a web banner and unless I’m searching with an intent to buy immediately (as opposed to just conducting research), I generally ignore the PPC ads that seem to surround everything. As it turns out the average U.S. small/medium business spends $17,000 on online services, compared with $6,800 on online advertising, hence the conclusion about it not being a medium. Then again, there is a big division even within this group since those with fewer than 50 employees will spend less than $500 a year, while a mid-size business with more than 50 employees will spend an average of $63,000. The little guys spend a higher percentage of their budgets on web hosting and their site (make sense since this is the one indispensable element in my opinion) as well as email and SEO (getting found is always important!). Once the budgets grow the companies can afford to branch out into other areas (blog management, analytics, etc.). I’ve seen that occur with some companies for which I’ve worked. Here on the screed we probably don’t think about the interwebs as a service-driven space and probably spend too much time on it as a medium I’m going to rethink that based on this study since many of the folks who contact me fit the small and medium business category. What do you think?